Welcome back. The town was Oklahoma City and Saturday night at the National Cowboy & Western Heritage Museum’s big Western Heritage Awards event the stars were out. Lynn Anderson, Rex Linn, Red Steagall and the list could go on as common folks mixed with the famous all gathering together celebrating our western heritage. Fess Parker’s daughter Ashley was there visiting about her childhood as the daughter of America’s number one hero in the 1950s. Down another hallway Ernest Bourgnine was reminiscing about his long career in the film business with another group. T.V. and movie star Bruce Boxleitner was there to accept his award and Burns Hargis, President of OSU, Larry Nichols, CEO of Devon Energy, Garth Brook’s buddy Ty England were in attendance, along with dozens of others all decked out to support this wonderful museum. One of the most touching moments of the evening came when Temple Grandin was inducted into the Hall of Great Westerners. For those of you who haven’t heard of her, Grandin is a woman who has overcome autism to become a highly respected advocate for animal welfare with a doctorate in Animal Science as well as an author and film producer. She received a standing ovation as she walked onto the stage. Chuck Schroeder, the President of the museum, tells me that plans are already underway for next year’s event and my friends if you’re a fan of the old west it’s a party you don’t want to miss. Sadly, this week I also need to note the passing of another historical figure with ties to Bartlesville. Her name was Virginia Lee Phillips and her husband was Chope Phillips, the son of Waite Phillips whom I’ve written about frequently over the years. Born on October 24, 1922, she grew up with a love of reading and the arts which was unusual for a woman in her time She met Chope in 1943 and they were married in 1947. Waite Phillips recognized Virginia’s talent and intelligence and schooled her in financial management and investments. With his encouragement she took a leading role in the management of several of the family foundations. Virginia and Chope both loved ranching and owned several big spreads together before they retired in 1993 and moved to Amarillo to be close to their children and grandchildren. Chope and Virginia both attended last year’s The Good, The Bad and The Barbeque, the big Elder Care event that is coming up on May 12th and she impressed me with her gentle thoughtful spirit. She told me that although she had been many places in the world, she missed coming to Bartlesville. She thought Bartlesville was a special place and that Mullendore embodied the spirit and history of the area. Virginia Lee Phillips, 89 years young, we’ll miss you. Till next week I’ll see ya down the road….. Welcome back. This week I’m in Oklahoma City, partially on business but mostly for fun as its time again for the Western Heritage Awards which open to the public on Friday night with Jingle Jangle Mingle. This opening night event takes place up and down the hallways of the Western Heritage Center, or as I’ve said before, the Cowboy Hall of Fame. There’s food and beverage stations everywhere as movie stars, film producers, writers, politicians and corporate leaders mingle with everyday folks in the setting of this beautiful museum. Questions and cameras are welcome and autographs are given out freely upon request. In the past year I’ve traveled from coast to coast and have attended my share of gatherings and friends the Friday night Jingle, Jangle, Mingle is at the top of my list for great events. Saturday the festivities start off early with sit down conversations with the “legends of westerns” as I call them. Last year the famous film producer A.J. Lyle, Patrick Wayne and Stuart Whitman were just a few of the big names who were there and they would just basically pull up a chair and talk. There will be several of these seminars going on throughout the day, leading up to a black tie awards ceremony on Saturday night. The awards ceremony this year will be hosted by Academy Award winning actor Ernest Bourgnine and Wyatt McCrea, the grandson of the late actor Joel McCrea. Bourgnine’s sixty year career includes close to 200 films including Marty for which he won an Oscar. He is probably still best known for his role as Quinton McHale in the 1960s TV series McHale’s Navy. Wyatt McCrea is the President of the Board of Directors for the Joel and Frances McCrea Ranch Foundation in California and he is very involved with several other not-for-profit boards. An actor with his own production company, Wyatt has also been the executive producer for many T.V. and movie projects but like his grandfather, at heart he is a rancher. Wyatt is also dedicated to keeping the history of the old west alive and preserving the memories of the men and women who made that history. His stories about growing up on his grandfather’s ranch and playing with the likes of Gary Cooper and Alfred Hitchcock are sure to flow when he and Bourgnine hit the museum’s front door. One of the things on the agenda for Saturday night is induction into the Hall of Great Westerners and I wanted to mention two of this year’s honorees. Bruce Boxleitner has been in dozens of films beginning with The Chadwick Family in 1974. His television career started with the role of Rick on the Mary Tyler Moore show in 1973 which was followed by work in Hawaii 5-0, Gunsmoke, Baretta, Police Woman and How The West Was Won. Boxleitner will for sure be a draw for both Friday and Saturday nights. The second fellow will receive this honor posthumously as he died in 2010. Originally from Texas, Fess Parker became a household name after Disney signed him up to play Davy Crockett, King of The Wild Frontier in 1954. It was a big hit and in 1964 Parker starred as Daniel Boone in another Disney box office hit. He went on to play several other western heroes in productions for Paramount and Warner Brothers studios. In 1986 Parker began a second career in Santa Barbara where he built two first class hotels and then purchased 714 acres in the Santa Ynez valley. He established the Fess Parker Vineyard and Winery on the property in 1987 and today his son and daughter run the business. In 1998 Parker purchased the Grand Hotel in Los Olivos right down the road from his winery. He renamed the hotel Fess Parker’s Wine Country Inn and Spa and was often seen eating there right up to his death. Parker was passionate about the performing arts and his generous gifts to various arts organizations became as legendary as his own acting career. If you can’t make it this weekend, don’t worry. 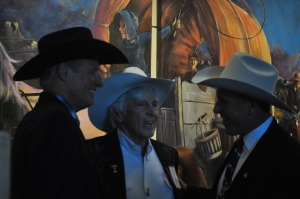 Next week I’ll bring you all the scoop on the Western Heritage Awards including a behind the scenes story on just what it takes to put on an event like this from my friend Wyatt and Ernest Bourgnine. Till then I’ll see ya down the road…. I was in Santa Monica when Whitey Bulger was captured and I did a story about him at the time which can be found in the archives of Down The Road. This week I’m bringing you a follow up report on Whitey and Catherine Greig. According to the Associated Press,Greig the long time girlfriend, has agreed to plead guilty to several charges and could do as little as thirty two months under federal guidelines. With this plea she will not have to testify against Whitey. Whitey’s day in court has been set by a federal magistrate for November 5, 2012. The defense attorneys had asked for more time to review the thousands of pages of documents filed by federal prosecutors as evidence but their request was denied. The government also filed hundreds of recorded wiretaps and a document entitled “My Life in the Irish Mafia Wars” which was discovered in a Boston home in 1995 that belonged to Whitey. A second document was found in the Santa Monica apartment which prosecutors claim is Whitey’s autobiography. It was discovered along with eight hundred thousand dollars in cash which had been hidden in the walls of the apartment. In Massachusetts Whitey is being charged with racketeering, murder, conspiracy to commit murder, drug dealing, extortion and money laundering. When this trial is over he is wanted in other states including Oklahoma where he is implicated in the 1981 murder of Tulsa businessman Roger Wheeler who was shot to death in the parking lot of Southern Hills Country Club . In 2006 Whitey’s life was depicted in The Departed, a movie directed by Martin Scorsese starring Jack Nicholson and Leonardo Di Caprio. I imagine with the new information coming to light part 2. won’t be far off. Another true American mystery is the story of D.B. Cooper who parachuted out of a hijacked Boeing 727 with $200,000 in ransom money, a case which remains the only unsolved hijacking of an American airliner in history. Although the FBI doesn’t know what the initials D.B. stood for, a man calling himself Dan Cooper purchased a one way ticket from Portland, OR to Seattle, WA the day before Thanksgiving 1971 fromNorthwest Airlines. Cooper was in his mid-forties and around five foot ten. He wore a black raincoat, dark suit, white shirt and black necktie. Witnesses said he could have passed as a funeral home director or a banker. Well friends, a retired law enforcement officer has brought a tip to the FBI. They are saying it’s credible and according to FBI Special Agent Frederick Gutt, it’s the most promising lead they’ve ever had in the case. The retired officer claims that the hijacker died ten years ago and Agent Gutt is trying to match the finger prints they have on file from the plane with the fingerprints of this deceased person. The last anyone saw of Dan Cooper was when he lit a cigarette (which you could do in 1971) ordered bourbon and water and then became an infamous figure in American history. Over the past eight years I have written many stories both about good men like Waite Phillips and about outlaws like these. It’s all history, both the good and the bad, and I hope you enjoy it. Welcome back. It was 1969 when John Wayne won “Best Actor” at the Academy Awards for his performance in True Grit. He had played the drunken, uncouth worthless son of any mother U.S. Marshall Rooster Cogburn. The high point of the movie is a scene in which the one eyed Marshall, riding his favorite horse with the reins in his teeth, charges four desperadoes alone and kills all but one them. Just as he is about to be done in by the remaining outlaw Lucky Ned Pepper, who is played by Robert Duvall, a shot from Texas Ranger La Boeuf saves him. La Boeuf was the first movie role for singer Glen Campbell whom I was lucky enough to see in concert last Tuesday night at the Osage Event Center in Tulsa. It’s been 43 years since True Grit was released and Campbell admits that the road since then has been tough at times. Now battling Alzheimer’s disease, he has found strength in his continued love of music and performing. On this night Campbell gave the sold out audience everything he had and the crowd responded with numerous standing ovations. His famous voice is still in good form and his guitar playing made it easy to understand why the Beach Boys, the Monkees and the Righteous Brothers among many others recruited him to play on many of their hit records. Three of Campbell’s children, Cal, Shannon and daughter Ashley played with him along with a thirty year Glen Campbell veteran arranger playing piano and rhythm. In between songs there was plenty of joking and laughter and his kids helped him over any rough spots. Campbell plans to keep doing what he loves and that’s making music with his family. As for me I would gladly pay double to see him play just one more time. Locally there’s bound to be a few area legends this coming Saturday at the Nutrition Program’s Chili Cook-off at the old Bluestem school in Dewey. With close to fifteen teams competing the samples will make a meal and I promise no one will leave hungry. There will also be a big Easter Egg hunt which is free and open to the public and Dewy fire trucks, police cars and other emergency equipment will be on hand for viewing. This promises to be an afternoon of good clean old fashioned family fun and time well spent. All are welcome and I hope to see you there. This week I also have the scoop on a few other local places to have fun. Although they are open five days a week Tuesday, Wednesday and Thursday nights are slower making them a good time for the two open air patios on the 16th floor of the Price Tower where you can sit and enjoy spectacular views of downtown Bartlesville and beyond. Copper Bar is open on the 15th floor offering drinks and appetizers while you’re visiting with friends or just relaxing. The next spot is the Birch Lake campground. Quiet, with only the noise of critters in the background, this well kept secret is a great place for a drive or to camp a night or two this time of year and that’s coming from a seasoned tent camper. Another great place for a drive and a picnic is the Tallgrass Prairie Preserve outside of Pawhuska. There is a lovely shaded picnic area with tables alongside Sand Creek in sight of the former Chapman Barnard bunkhouse. Now owned by The Nature Conservancy this property is part of the ranching history of our area. The famous tall grass swings in the breeze, bison roam freely across the prairie and you are surrounded by peace and quiet. It is well worth your time to visit this incredible place which is also free and open to the public. My weekly column from a recent day trip to Bentonville, Arkansas where I discovered two great places. Welcome back. The place is called Crystal Bridges, the magical name fits and last Friday found me there. Bentonville, AR is of course where Sam Walton started his first store, Walton’s Five and Dime. The original store is at the center of the old town square and today it is a free museum devoted to Mr. Walton’s accomplishments and it is a nice place to spend an hour or so. Less than two miles away and hidden from view in a deep ravine is Crystal Bridges Museum of American Art founded by Sam’s daughter Alice Walton. The museum was designed by the international architect Moshe Safdie and is truly a wonder, a multi-level building made up of a series of connected pods which surround a pool of water bubbling up from an underground spring. High walls of glass let the light pour in to various parts of the museum and other areas open onto decks overlooking the water. Although no final costs have been made public, construction estimates for the building and building systems alone are around $100,000,000. This does not include the fine examples of American art that are showcased here, many of which are literally priceless. The museum has a collection of over 1,000 works and 432 of them are currently on display. The other pieces are either on loan to other institutions or in storage. These works will be displayed at a later date as the collection is rotated. The underlying philosophy at the museum is that both art and nature are vital to the human spirit. Three miles of hiking trails cross the museum grounds which are beautifully landscaped and feature waterfalls and sculptures. Everything at Crystal Bridges is well marked and there are dozens of helpful docents and museum employees to explain things and help you find your way around. I took the self guided tour but you can also join a group led by a docent or take an audio tour. The museum is open to the public and it is all free. There is also no charge for parking, making this an amazing opportunity to visit a spectacular building and see some American treasures. Another pleasant discovery on this adventure was the River Grille Steakhouse where I might have had the best steak I have ever eaten. The restaurant is conveniently located right on exit 88 off 540 and just a mile from Crystal Bridges. There is also a Bartlesville connection here as I learned that Jim Curd, the owner of Sterling’s Grille, is also an owner of the River Grille. The excellent service and delicious food that we are accustomed to at Sterling’s was on hand at the River Grille as well. We sampled many great dishes, from appetizers to deserts and if you are going to Bentonville it is certainly worth a stop to check’em out. I have also learned that the Curds’ son is now running the Dink’s in Bentonville making the restaurant business a true family tradition. This ten hour day trip would not have happened without the vision of Alice Walton who has donated a large portion of the funding for construction of the building and the acquisition of the artwork She is clearly committed to establishing a major art museum in the Ozarks and has dedicated a substantial part of her 21 billion dollar personal fortune to making this a reality. During my visit, the museum was full of people, seemingly from all walks of life and many of whom may never have been in a museum like this before.